Simply enter your details in the form below and we will send you a copy of LISTING RICH absolutely FREE! 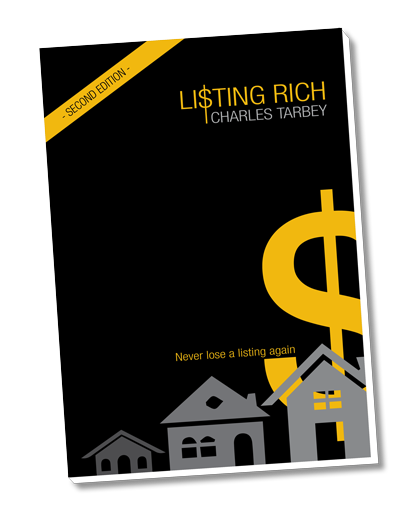 Charles Tarbey's classic Listing Rich has been updated and re-written for 2019.
handbook was first released in 1994, a long time before the advanced technology of today which has well and truly changed the way we deliver our message. 'Deliver' is the key word here meaning that whether we deliver information by voice, mail or email, we still deliver the information. Despite advances in technology, what has not changed is the professional way in which we should deal with our customers and clients. Many successful agents today still take exactly the same approach as that displayed by the successful agents who were operating when I first entered the industry in the early seventies. They are still delivering information, only today by email rather than snail mail and with a focus on personal contact - a key ingredient to achieving sustainable, consistent results.